Our prophet has told us that we need to get out of debt. With a (highly likely) economic collapse on the horizon, one would think our government would be wise to heed the prophet’s counsel as well. Fat chance. I was intrigued to find on the Bureau of Public Debt’s website that in the past year our nation has accumulated half a trillion dollars in debt. Since Bush came into office we’ve increased our national debt by three trillion dollars. And no, Mr. Bigglesworth, that’s not a catchy number thrown out by Dr. Evil. Three trillion dollars. 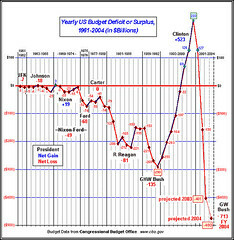 An interesting yearly projection of the budget can be seen here. With all this debt (to foreign countries as well as ourselves) I begin to wonder if these countries are now in a position to exert control over our legislative process. Eek. Also be sure to check out this article with some wise words of Walter E. Williams.